Hubble Space Telescope has snapped a panoramic portrait of a vast, sculpted landscape of gas and dust where thousands of stars are being born. This fertile star-forming region, called the 30 Doradus Nebula, has a sparkling stellar centerpiece: the most spectacular cluster of massive stars in our cosmic neighborhood of about 25 galaxies. The mosaic picture shows that ultraviolet radiation and high-speed material unleashed by the stars in the cluster, called R136 [the large blue blob left of center], are weaving a tapestry of creation and destruction, triggering the collapse of looming gas and dust clouds and forming pillar-like structures that are incubators for nascent stars. The photo offers an unprecedented, detailed view of the entire inner region of 30 Doradus, measuring 200 light-years wide by 150 light-years high. The nebula resides in the Large Magellanic Cloud (a satellite galaxy of the Milky Way), 170,000 light-years from Earth. 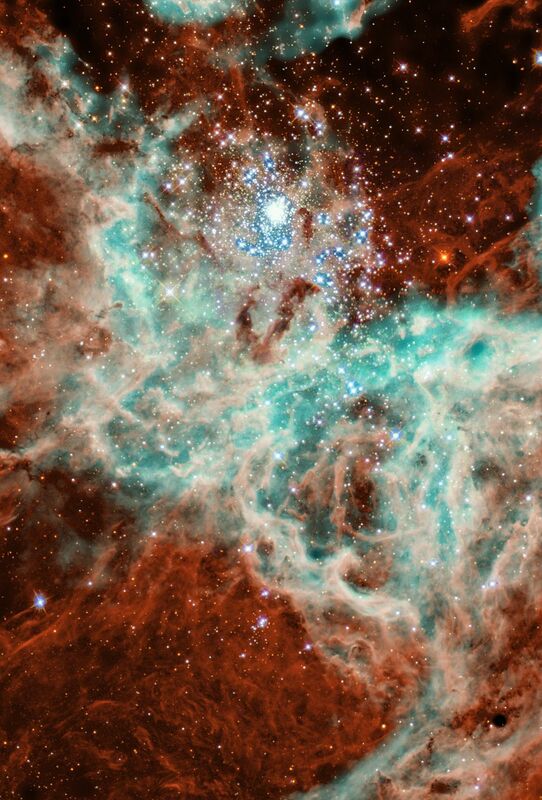 Nebulas like 30 Doradus are the "signposts" of recent star birth. High-energy ultraviolet radiation from the young, hot, massive stars in R136 causes the surrounding gaseous material to glow. 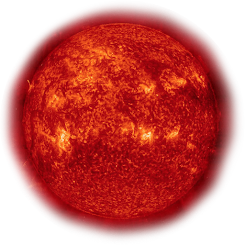 Previous Hubble telescope observations showed that R136 contains several dozen of the most massive stars known, each about 100 times the mass of the Sun and about 10 times as hot. These stellar behemoths all formed at the same time about 2 million years ago. The stars in R136 are producing intense "stellar winds" (streams of material traveling at several million miles an hour), which are wreaking havoc on the gas and dust in the surrounding neighborhood. The winds are pushing the gas away from the cluster and compressing the inner regions of the surrounding gas and dust clouds [the pinkish material]. The intense pressure is triggering the collapse of parts of the clouds, producing a new generation of star formation around the central cluster. The new stellar nursery is about 30 to 50 light-years from R136. Most of the stars in the nursery are not visible because they are still encased in their cocoons of gas and dust. Some of the nascent stars are forming in long columns of gas and dust. Previous Hubble observations revealed that the process of "triggered" star formation often involves massive pillars of material that point toward the central cluster. Such pillars form when particularly dense clouds of gas and dust shield columns of material behind them from the blistering radiation and strong winds released by massive stars, like the stars in R136. This protected material becomes the pillars where stars can form and grow. The Hubble telescope first spied these pillars of stellar creation when it captured close-up views of the Eagle Nebula. The new image of 30 Doradus shows numerous pillars — each several light-years long — oriented toward the central cluster. These pillars, which resemble tiny fingers, are similar in size to those in the Eagle Nebula. Without Hubble's resolution, they would not be visible. One pillar is visible within the oval-shaped structure to the left of the cluster. Two [one dark and one bright] are next to each other below and to the right of the cluster. One pillar is at upper right, and still another is just above the cluster. Newborn stars within most of these pillars already have been discovered in pictures taken by Hubble's infrared camera, the Near Infrared Camera and Multi-Object Spectrometer, which can penetrate the dust to detect embryonic stars. Eventually, intense radiation and stellar winds from the developing stars will blow off the tops of the pillars. The Hubble image shows that one such eruption already has occurred in 30 Doradus. A trio of young stars has just been "born" by breaking out of its natal pillar. These new stars are just a few hundred thousand years old. In another 2 million years, the new generation of stars will be in full bloom. But the massive stars in R136 will have burned themselves out. And the nebula's central region will be a giant shell, devoid of gas and dust. Still later, all of the most massive stars and gas will have disappeared from the entire region. Only older, less massive stars will remain in a region cleared of gas and dust. The mosaic image of 30 Doradus consists of five overlapping pictures taken by Hubble's Wide Field and Planetary Camera 2. Several color filters were used to enhance important details in the stars and the nebula. Blue corresponds to the hot stars. The greenish color denotes hot gas energized by the central cluster of stars. Pink depicts the glowing edges of the gas and dust clouds facing the cluster, which are being bombarded by winds and radiation. Reddish-brown represents the cooler surfaces of the clouds, which are not receiving direct radiation from the central cluster.